One of the perks of being a Crown & Anchor Society Member on Royal Caribbean is having the opportunities to see behind the scenes of the ship. As Crown & Anchor Society members, our family was invited to take a tour of the Bridge and Galley on Splendour of the Seas. We had been interested in taking the tour since we had been talking about a funny structure that stuck out of the side of the boat which was directly in front of our room on Deck Eight. We had watched the crew a few times guiding the ship when we were docking in the ports. I was very excited when I saw a little envelope in our room with the invitation asking us if we were interested in taking a bridge and galley tour and I of course signed us up. It was a little hard getting all the kids up for a 8:30 a.m. tour, but I managed to get two out of the three up. We were escorted to the front of the ship by one of the officers. An interesting fact that we learned was when a ship in underway the bridge is manned by an OOW (officer of the watch) aided usually by an AB (able seaman) acting as lookout. We even got to spend time with Officer Bradley who was the officer on the Bridge in charge of the ship the day we took the tour. She and her crew went over some of the radar instruments they use to navigate the ship. They took us on a tour of the flying bridge outside of the ship. Part of the floor is glass to allow them to navigate and moor the ship. Although, I know the glass floor was safe to stand on, I kept my distance since standing over a glass floor with a hundred feet of air beneath me is NOT my idea of a good time. But my kids and husband were totally into it. 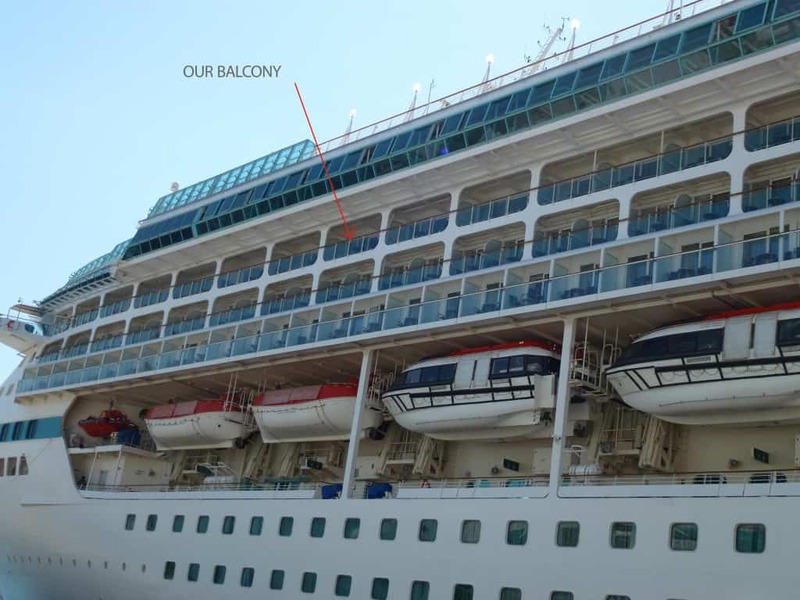 The Splendour of the Seas bridge tour showed how complex maneuvering this floating hotel is. The orderliness and professionalism of the team provided some nice reassurance that we were in good hands. When you are on your next cruise, even if it’s first one, you should signup while on your cruise so that you can take advantage of the Onboard Booking Bonus and also ensure that all of your benefits of Crown & Anchor Society membership begin on your next Royal Caribbean cruise vacation. In the Crown & Anchor Society, your level in the program depends on the number of cruise vacations you have taken and it’s easier to get credit for them if you are signed up from the start. Wow. That looks like an amazing insight into the complexity behind driving a cruise ship! I also didn’t know about the Crown & Anchor Society since I’ve yet to go on a cruise but am always keeping my eye out for cruise options and am glad to know about that membership option! Hi Carolann, I signed us all up including the kids a few years ago. Every time you go on a cruise you earn points for the cruise. Once you’ve reach a certain level you get bonus money that can be used on the cruise or gets discounts on your next cruise. Are are all Platinum level which is a pretty nice. We get access to the concierge level on some of the ships. It’s definitely worth doing. These kinds of perks when you join loyalty programs on a cruise ship are great! They really know how to honour their past passengers. I just got Platinum on my last Princess Cruise, so can’t wait to take advantage of that the next time I’m on board! I think the biggest perk there for me is getting some free Internet minutes and priority boarding! Hi Lauren, People don’t realize how many perks you get when you join the loyalty clubs on a cruise ship. I’m sure our kids will thank me one day when they get older and go on a cruise ship with their families. I made sure to sign them all up from the beginning. Very interesting. I’ve never been on the bridge of a cruise ship. Yes, I imagine that it would be quite difficult maneuvering such an enormous ship. I have a hard enough time with a jet ski. I’m looking forward to your Galley tour.